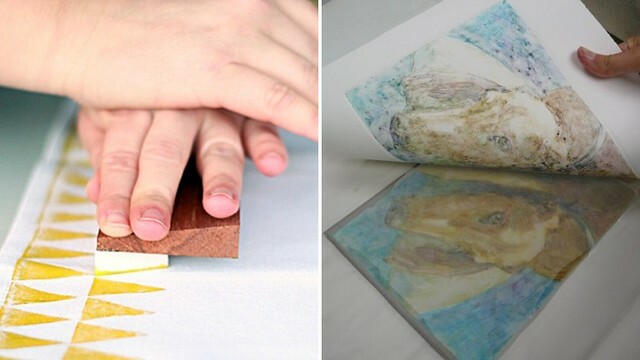 Block Printing (left) image credit; Monoprinting (right) image credit. Description: Try your hand at two different printmaking techniques - block printing and monoprinting. Block printing utilizes a stamp (anything from a simple eraser to a carved wooden block) to reproduce the same image over and over again. Just add ink to your stamp and continue printing. Monoprinting, on the other hand, is a technique that produces single images. Add ink or paint to a smooth plate, cover with a sheet of absorbent paper, and run through a press. Since there will only be enough ink or paint on the plate for one impression, your monoprint will be unique. We'll be working with paper in this introductory class, but both techniques are applicable to fabric! Jerushia Graham: Jerushia has a BFA in Fabric Design and a BFA in Printmaking from the University of Georgia, as well as an MFA in Book Arts/Printmaking from the University of the Arts in Philadelphia. She has developed community art programs, designed public art installation, and exhibited widely, and she is currently the Museum Coordinator for the Robert C. Williams Museum of Papermaking. Required Supplies: Please wear painting clothes or bring an apron. Supply Fee: None, the Museum will provide paper, ink, and equipment. If you have trouble registering or paying (Safari users!) or if you are concerned that this website does not have an https address, please use the following direct link for registration and payment: https://sefaa.secure.force.com/Programs/CnP_PaaS_EVT__ExternalRegistrationPage?event_id=a0u0V00000kfYBgQAM.